The Afflicted Brethren are five vampires found in Gutted Mine. 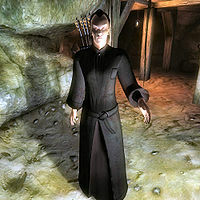 They were once worshippers of Azura, and were infected with vampirism when they slew a powerful vampire named 'Dratik'. Azura will enlist your support in "releasing" them from their curse as part of her quest. Although all five vampires are named "Afflicted Brethren", one of them carries a Worn, Faded Note, which can be used to work out which was which from their names and races. Aranalda is the only archer in the party. She wields a leveled short blade, but her main weapon is her leveled bow that can be enchanted at level three and above. She also carries arrows that again can be enchanted - this time at level four plus, and may even carry a staff (25% chance). Aranalda is clad in a random lower-class robe. Ghola gro-Muzgol is the one who holds the Worn, Faded Note. He wears a leveled cuirass, greaves and shield and wields a leveled weapon that can be of any type and may be enchanted at level three or above. Ghola also carries a spare set of random lower-class clothes. 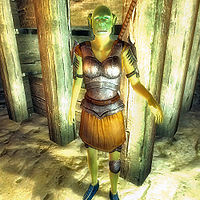 Nille Elf-Daughter wears light armor, with a guaranteed cuirass, shield and greaves of the best quality for the player's level, along with a 25% chance of a pair of boots and pair of gauntlets. She wields a leveled blade that can be enchanted at level three or above. She may cast a leveled Illusion spell. Nille also carries a spare set of random lower-class clothes. 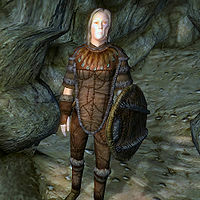 Avita Cassiana will always wear a leveled pair of light gauntlets but only has a one in four chance of wearing any other piece of armor - a leveled light cuirass. She can cast one leveled Alteration spell. Avita wears a set of random lower-class clothing. 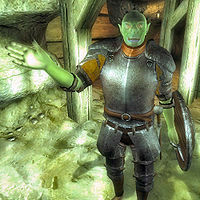 Umar gra-Khar wears a leveled heavy cuirass and greaves and wields a two-handed weapon that may be enchanted at level three and above. She can cast a leveled Destruction or Restoration spell. Umar wears random upper-class shoes and carries a spare pair of upper-class pants, as well as a spare upper-class shirt. All five brethren carry a portion of Vampire Dust in their inventories, unlike most Vampires whose Vampire Dust only appears after their death. 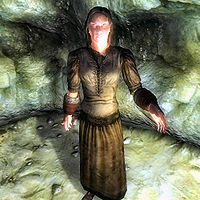 Therefore, the brethrens' dust can be pickpocketed from them before they die. If this happens, another sample does not appear on their bodies when they are killed. This page was last modified on 12 July 2018, at 01:56.